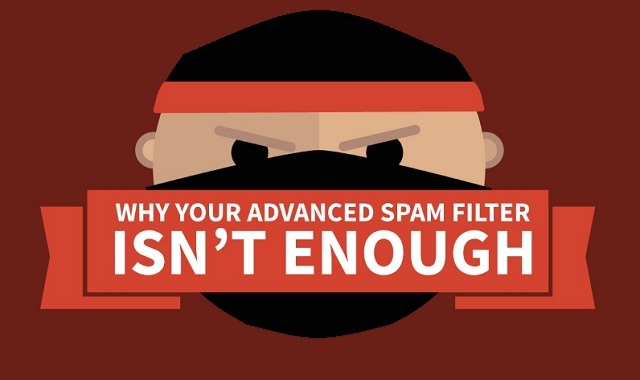 Why Your Advanced Spam Filter Isn't Enough #infographic ~ Visualistan '+g+"
Advanced spam filters are a wonderful thing. Don’t get me wrong. But they aren’t enough to protect your organization from a phishing attack. If you’ve heard it once, then you’ve heard it a million times, it takes just one employee to click a malicious link or download an infected document to give your IT Support a headache or, much worse, cause a data breach. According to The Radicati Group, a technology market research firm, 112.5 billion business emails are sent every day. There are approximately 1.08 billion corporate email accounts worldwide, meaning that each account is sent an estimated 104 emails each day1. According to research by Symantec, 53.2 percent of emails are spam2. Based on this, the average business email account is sent 55.3 spam emails every day.